On 31.01.2018, Tome Eftimov successfully defended his PhD thesis. 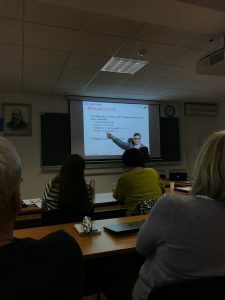 His work entitled “Statistical data analysis and natural language processing for nutrition science” was conducted under the supervision of Assist Prof Barbara Koroušić Seljak from the Computer Systems Department, Jožef Stefan Institute (JSI) as part of the ERA-Chair ISO-FOOD project. The thesis was evaluated by the examiners: Prof Nada Lavrač from the Department of Knowledge Technologies, JSI, Prof Sophia Ananiadou from the School of Computer Science, University of Manchester and the UK Centre for Text Mining, and Prof Peter Korošec from the Computer Systems Department, JSI. If you are interested in Tome’s research results, you can follow him on ResearchGate.